Buying a ticket for Saturday's Bruno Mars concert in Toronto was probably never going to be cheap, but what many of the star's 17,000 fans who scored a seat might not realize is it wasn't just scalpers driving up prices. A CBC News and Toronto Star investigation reveals how box-office behemoth Ticketmaster uses its own bag of tricks — which includes partnering with scalpers — to boost its profits at the expense of music fans. Data journalists monitored Ticketmaster's website for seven months leading up to this weekend's show at Scotiabank Arena, closely tracking seats and prices to find out exactly how the box-office system works. Ticketmaster doesn't list every seat when a sale begins. Collects fees twice on tickets scalped on its site. 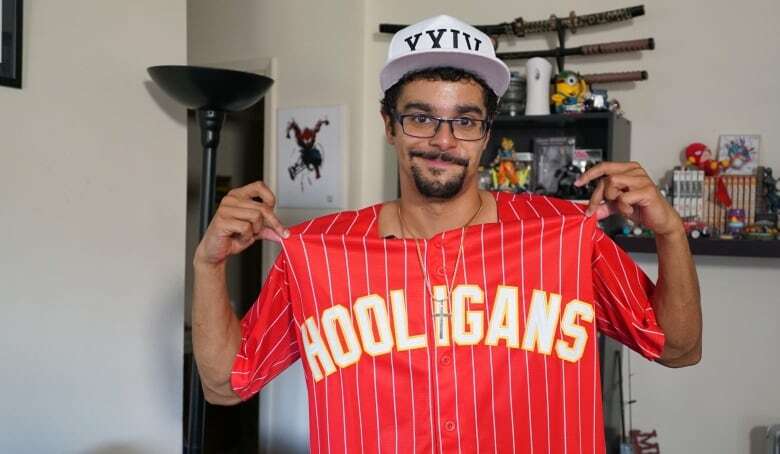 "I definitely feel like I'm getting ripped off," said Ajay Saulnier, 31, a Bruno Mars superfan and impersonator from Hamilton who was dismayed by CBC's findings — particularly since he says he can't afford a ticket to his idol's show. "It's definitely unfair for the public. They're only caring about padding their own pocket." The most common criticism of scalpers is that they hike the price of tickets way beyond their so-called face value — the price set in advance by the box office. But scalpers aren't alone in increasing prices mid-sale. Within five minutes of tickets going on sale at noon on Feb. 16, it appeared the arena was nearly sold out. Most of what remained were tickets priced at $500 or up to $2,500 for a spot in the front row. As fans scrambled, Ticketmaster ripped a page from the proverbial scalper handbook and began increasing prices for some seats. Thirty-two of the seats were part of Ticketmaster's "platinum tickets" program. A pop-up window on the website notifies buyers that "Platinum Tickets are tickets that are dynamically priced up and down based on demand." What the pop-up doesn't mention is the original price, or face value, so the buyer is missing information to determine if they're getting a good price. And CBC also found 120 non-platinum tickets that increased from $191.75 to $209.50 after the sale began. "That's absolutely terrible. They should not be doing that," Saulnier said. "They don't need to be making this much money off a ticket just for us to see an hour show." Ticketmaster declined CBC's requests for an interview. In a statement, the company said it does not own the tickets and that "prices are set by the seller," pointing to Bruno Mars's management team and the venue. "Ticketmaster is a technology platform that helps artists and teams connect with their fans," the company said. "We do not own the tickets sold on our platform nor do we have any control over ticket pricing — either in the initial sale or the resale." Bruno Mars's team did not respond to multiple requests for comment. Maple Leaf Sports and Entertainment, which owns the Scotiabank Arena, referred comment to the concert's promoters. The 24K Magic World Tour is promoted by Live Nation, which owns Ticketmaster. According to recent reports to shareholders, Ticketmaster hopes to boost profits with its "market-based pricing," which changes according to supply and demand "to price tickets closer to their true value." In 2017, the company made $2.1 billion from ticket sales, up from $1.8 billion the year before. Initial prices for tickets ranged from $56 to $2,500, but there were fewer than 150 seats available at $56, all in the back rows of the upper levels farthest from the stage. Ninety minutes into the sale, Ticketmaster started releasing hundreds more tickets for between $99 and $159, including a slow dribble of seats from eight additional sections to the side and behind the stage that weren't initially available to fans. Hundreds more tickets were added in June, July and August. "They're artificially driving the price up. They're artificially giving the impression of high demand," said Tony Merchant, a class-action lawyer who launched a fan lawsuit against Ticketmaster in February after Canada's Competition Bureau accused the company of price-gouging. As with setting prices, Ticketmaster told CBC News it is not responsible for deciding how seats get released for sale. 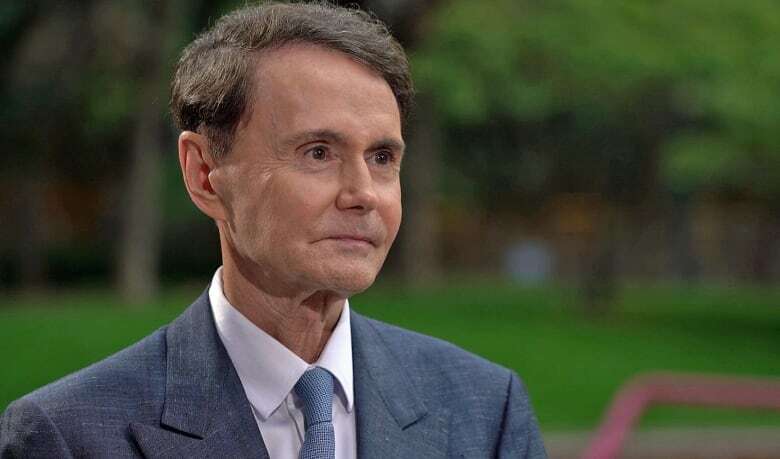 "We also do not determine when tickets are available for purchase or how they are allocated — those decisions are communicated to us by our client, the venue, after consultation with the event presenter." But as the next trick shows, Ticketmaster has an incentive for trying to drive up those prices — for its platinum seats, as well as for those scooped up by scalpers. 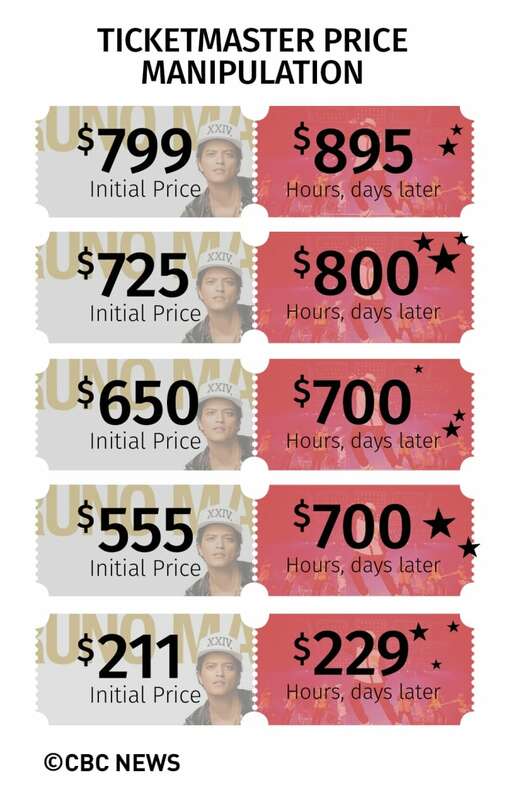 Ticketmaster charged $350,000 in service fees for the Bruno Mars concert — and then nearly doubled that revenue with resales. The company, which for years publicly denounced scalpers, now runs a "verified resale" program that lets scalpers sell directly on Ticketmaster's site — and lets the company collect fees a second time for the same ticket. CBC counted more than 4,500 Bruno Mars resale tickets on Ticketmaster, meaning that if Ticketmaster sells every seat in the arena for Saturday's show, it would collect an initial $350,000 in service fees, plus $308,000 in fees on scalped tickets, for a double-dipped total of $658,000. Ticketmaster's statement to CBC News didn't address questions about its fees.